The conflict in Nepal (1996 – 2006) resulted in an estimated 15,000 deaths, 1,300 disappearances, along with other serious human rights and humanitarian law violations. Demands for peace, democracy, accountability and development, have abounded in the post-conflict context. Although the conflict catalysed major changes in the social and political landscape in Nepal, the transitional justice (TJ) process has remained deeply contentious and fragmented. This book provides an in-depth analysis of transitional justice process in Nepal. Drawing on interviews with a diverse range of stakeholders, including victims, ex-combatants, community members, human rights advocates, journalists and representatives from diplomatic missions, international organisations and the donor community, it reveals the differing viewpoints, knowledge, attitudes and preferences about TJ and other post-conflict issues in Nepal. The author develops an actor typology and an action spectrum, which can be used in Nepal and other post-conflict contexts. The actor typology identifies four main groups of TJ actors—experts, brokers, implementers and victims—and highlights who is making claims and on behalf of whom. The action spectrum, based on contentious politics literature and resistance literature, demonstrates the strategies actors use to shape the TJ process. This book argues that the potential of TJ lies in these dynamics of contention. It is by letting these dynamics play out that different conceptualisations of TJ can arise. While doing so may lead to practical challenges and produce situations that are normatively undesirable for some actors, particularly when certain political parties and national actors seem to ‘hijack’ TJ, remaining steadfast to the dominant TJ paradigm is also undesirable. 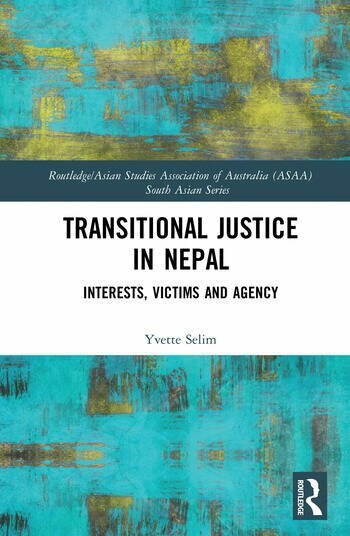 As the first book to provide a single case study on TJ in Nepal, it makes theoretical and empirical contributions to: TJ research in Nepal and the Asia-Pacific more broadly, the politics versus justice binary and the concept of victimhood, among others. It will be of interest to a wide range of scholars in the study of transitional justice, peace and conflict studies, human rights, sociology, political science, criminology, law, anthropology and South Asian Studies, as well as policy-makers and NGOs. Yvette Selim is a Senior Research Associate and Lecturer at the Institute for Public Policy and Governance, University of Technology Sydney, Australia. Her research interests include transitional justice, conflict resolution, peacebuilding, human rights, health, and development.